Today I want to share one of my favorite puzzles that I used with my students last year. It involves one of my favorite things in the world, Post It Notes (affiliate link)! I learned about this puzzle from Chris Smith's amazing maths newsletter. If you're not signed up to receive his newsletters, you need to do so ASAP. Each one is full of fun puzzles, teaching ideas, and so much more. The featured puzzle from Volume 373 definitely caught my eye. I recreated it with actual post-it notes on my dry erase board. My students were instantly drawn in. At first, they assumed the puzzle would be super easy. After struggling for a few minutes with no success, some students started doubting the puzzle's solvability. I loved that when a student thought he/she had arrived at a solution that it could be verified by actually moving the post-it notes. Some classes did manage to arrive at a solution. Others gave up. I used this puzzle as a random time filler last year. This year, I'm considering incorporating it into my first week of school activities. So does "remove" count as "moving" a note? Or do they have to move and stay in the problem. Honestly I'm also stuck on moving just one...but I'll keep working on it. thanks! I signed up for the newsletter too. Remove doesn't count as moving. 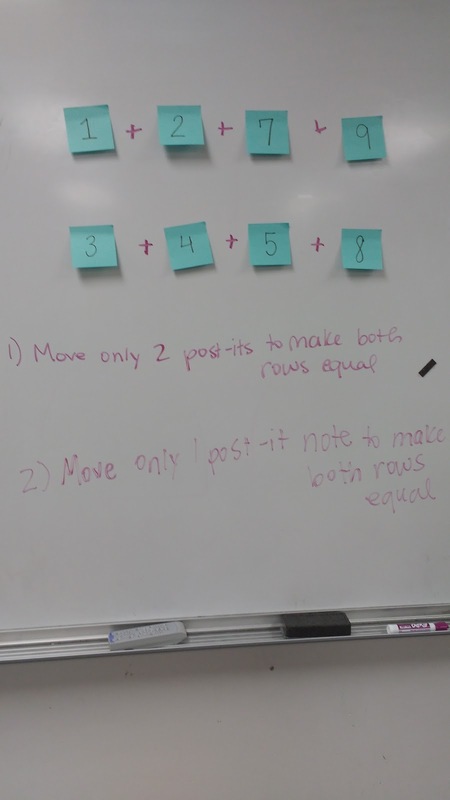 Think about moving to make an exponent. Or flipping over as you move. It really is a tricky question! Sarah, do you have a link to a hint or solution? This puzzle looks great for my class! I love this kind of stuff with my middle schoolers! Thank you for the newsletter sign up info! I can figure it out if I can remove one post it note. But all the numbers together equal 39 so I don't see how you can get each line to equal the same number. 39 isn't divisible by 2! Help!! You have to get tricky. Use exponents. Or flip a post-it note over, etc.